In a recent episode of Food Network’s “The Best Thing I Ever Ate“, snacks craved by food personalities were featured. 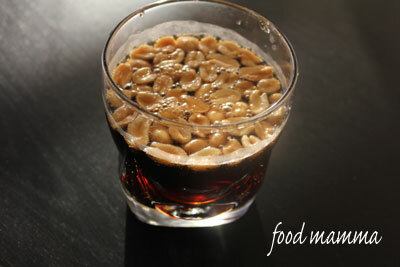 Giada’s favorite snack were the bar nuts at Union Square Cafe in New York. The hot nuts featured on the show looked so delicious, I started searching for the recipe. Luckily, Nigella Lawson featured the nuts in her show Nigella Bites a couple of years ago, and the recipe was easily accessible. Instead of using a mix of nuts, I used one of my faves, almonds. 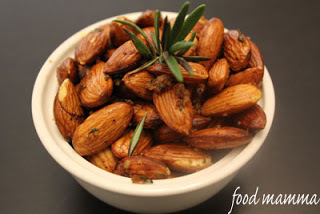 The scent of these nuts mixed with the rosemary and spices filled the house and we couldn’t wait for them to be cooled before devouring them. This delicious snack appeals to all as it satisfies any craving – salty, sweet, spicy, savoury. My only advice is that you make lots! A couple weeks ago, we went to sin city and had a fabulous few days there. It was a nice break and we enjoyed some quality family time. On our last day there, we stopped for some mint chocolate chip ice cream. It was the worst mint ice cream I have ever had! When we got home, I was happy to find some cream in the fridge and found my easy recipe for one of our favorite flavours. Dissolve the sugar in the milk. Add the rest of the ingredients (except the chocolate chips) and chill the mixture for an hour. Follow the directions of your ice cream maker. Add the chocolate chips in the last ten minutes. Enjoy! Shrimp is a staple in our home. It thaws easily and cooks quickly, it’s the perfect thing to pull out and make a quick meal with. We had family bringing dinner over (lucky us!) but I still wanted to make an appetizer. My fridge was stocked with peppers and onions and I thought this would be the perfect quick snack to make. Hubby loved them and even raved about them to our massage therapist – always a good sign. Can be served with roasted red pepper dip or garlic aioli. In a food processor, coarsely chop the raw shrimp. Transfer to a bowl and add the veggies, egg, mustard, salt and pepper. Add breadcrumbs, a little at a time, until the mixture can be formed into patties. Refrigerate the patties for about 5 to 10 minutes. Pan fry the shrimp cakes until shrimp is cooked and each cake has a nice brown crust. This past weekend, my little man turned 2! Seems like just yesterday he was born. We celebrated with a few friends and family with a Sesame Street themed music party. I think I shocked the people who knew me by not making a single thing! Well, I did make chocolate chip cookies for the kids to take home with a crazy straw for milk but besides that, nothing! We ordered pizza from down the street and snacked on veggies and chips and assorted flavours of crackers from the goldfish bar. My mom, who makes the most delicious cakes, baked Q’s cake and we got the local bakery to decorate it with the Sesame Street theme. My sister-in-law led the kids in song so they were able to play with their tamborines, xylophones and maracas which they were able to take home with them. All in all, it was a fun day! We have been lucky in the last couple of weeks to enjoy some great October weather. We took advantage of this last week and went to Canmore for the day. We had lunch at Luna Blue and enjoyed a feast of garlic with bruschetta, pizza and pasta. I had good friends coming over for a lasagna dinner and I needed a quick appetizer to go along with it. The garlicky bruschetta from the week before had been on my mind and I figured it would be the perfect starter. 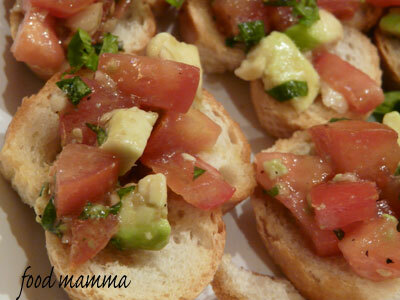 I added an avocado to the mix which added some texture and made the bruschetta creamy. It was a hit, even with the little ones. Slice the baguette on the diagonal and place on a baking sheet. Drizzle with olive oil and bake until toasted. Mix the ingredients for the brushcetta. Let stand for 10 minutes. Top the toasted baguettes with the mixture and enjoy! When visiting my cousin in Toronto this summer, she had made the most amazing banana bread. 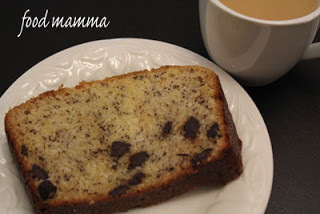 This bread is incredibly moist and so tasty, I was delighted when she shared the recipe. It became an instant hit and is now a regular in our house. Thanks A! Cream margarine and sugar together. Once combined, add eggs and vanilla. Next, mix in the dry ingredients – flour and baking soda. Add the mashed bananas, sour cream and chocolate chips. Add the batter to a loaf pan and cover with foil. Bake at 350 degrees for one hour. We have been eating way too much red meat lately. It was time to take a break and start making more chicken and fish dishes. Looking through my fridge, I found I had some chicken and spinach, so I figured I would make hubby happy and make an Indian dish. 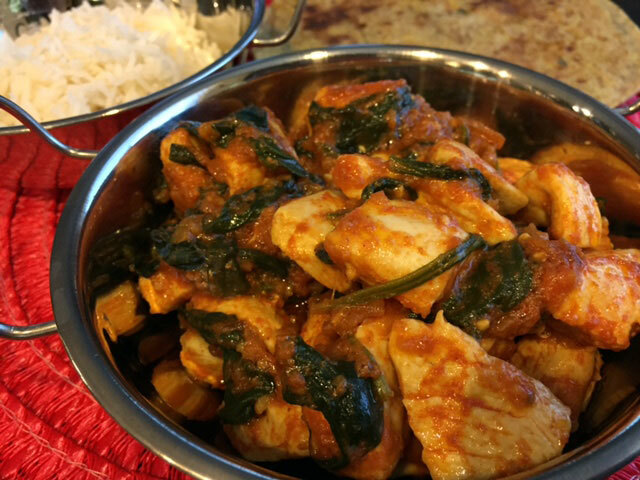 Indian food does not have to be complicated or time consuming. In less time than it took Q to watch an episode of “In The Night Garden”, this dish was ready to eat! Saute the chicken in the oil until half-cooked. 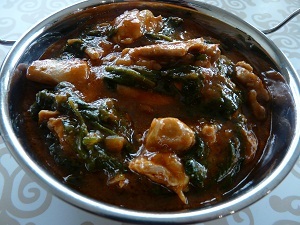 Add the spinach and continue cooking until chicken is cooked and spinach is wilted. Add the tomatoes, onions and spices and cook for a few minutes. Add water and let simmer for 10 minutes. Serve with rice or naan. Its getting cold out there! The winter chill is in the air and its not even fall (almost, but not quite)! With a weekend filled with cold and rain, comfort food was called for, like slow cooker chili. I love the slow cooker. You dump things in, plug it in and let it sit and cook for you. Plug it in in the morning and you have a delicious meal waiting for you when you come back home from work. I prefer plugging it in at night and enjoying the wonderful smells as I sleep. 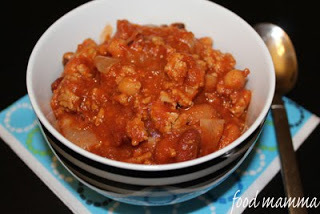 This is the easiest chili recipe and its delicious. Perfect for those cold, rainy days. Combine all ingredients in slow cooker and mix thoroughly.